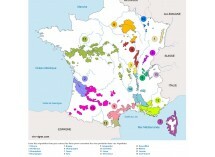 Loire wines? Order wines from Loire France quickly and safely! Le Connaisseur sells a wide range of Loire wines from the famous Loire region among which Joseph Mellot, Pascal Jolivet, Domaine des Baumard, Chateau de Nozet, Beatrice & Pascal Lambert, Chateau de la Fessardiere, Chateau Favray, Daniel Chotard, Domaine Cady, Lucien Crochet, Ackerman and Veuve Amiot. If you are looking for a Loire wine that is not on our website please contact us. When ordering your wine at Le Connaisseur, you can count on solid advice. Want to know more about wine from the Loire or a winery? Then we will be happy to help you find an appropriate Loire wine. And if you made your choice, you can easily order.